Angst Productions, established in 2004 by Dan Patterson, is a Soho-based independent production company specialising in TV comedy shows. Dan Patterson is a highly successful award-winning TV Producer. His career began as a producer for BBC Radio and following the success of Radio 4's Whose Line Is It Anyway? (which he co-created with Mark Leveson), he moved to independent TV production company, Hat Trick productions. There he produced the hit improvisation show Whose Line Is It Anyway? which ran for ten years on Channel 4 and won numerous awards including awards from BAFTA and the Royal Television Society. The Peter Principle, the BBC One sitcom starring Jim Broadbent which Dan also co-wrote. Dan also developed and produced Room 101 for BBC Two. Subsequently Dan took Whose Line Is It Anyway? to America producing it for ABC television. Hosted by sitcom star Drew Carey, Whose Line Is It Anyway? proved to be a major hit and ran for five years on primetime Thursday night giving the network their best audiences for seven years. The show, which was co-executive produced by Mark Leveson, starred Ryan Stiles, Colin Mochrie and Wayne Brady, who won an Emmy award for his role on the show. Guests included Robin Williams, Whoopi Goldberg, David Hasselhoff and Jerry Springer. A hilarious comedy panel show about celebrity. Six episodes were produced for primetime BBC One. The show was hosted by Bob Mortimer (The Smell Of Reeves And Mortimer, Shooting Stars) and featured two teams of three whose captains were impressionist Alistair McGowan and stand-up comedian Jo Brand. The guests were primarily comedians, including Matt Lucas, Eddie Izzard and Stephen Fry with the occasional actor or TV personality such as Carol Smillie, Ricky Tomlinson and Jennie Bond. The satirical comedy show returned for its eleventh series on BBC Two in June 2012 after successful previous series, which attracted audiences of three million for the Thursday night broadcast and a further one million for the repeated shows. 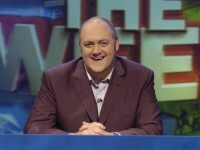 Mock The Week has steadily built up a strong following and provides one of the best opportunities for seeing up-and-coming stars and comedians new to TV. Dara O Briain, Frankie Boyle, David Mitchell and John Oliver all featured early on in their TV careers. Angst Productions has also produced pilot comedy shows for BBC and ITV. All of Angst's programmes have been co-created and produced by Dan Patterson's long-suffering collaborator, Mark Leveson. In 2004 Mark won a BAFTA award for the short film Brown Paper Bag.